No, I am not talking about the studio’s 30th anniversary, or Nels and Danielle’s upcoming wedding, or Anna preaching her first sermon to her home congregation, or Lars reading his first chapter book. They are all things in our life that we are celebrating right now. This time the spotlight is on Neil. 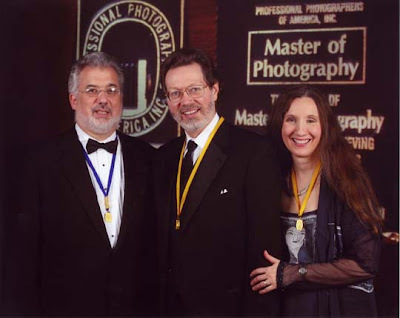 Neil has earned his Master of Photography degree from the Professional Photographers of America! This is harder to achieve and therefore more meaningful than any academic degree. You earn merits toward the degree through teaching, judging, attending accredited classes and service to the organization but you must also prove your talent by entering prints in the PPA competition and have them accepted as "merit prints". That is the big challenge. Let me tell you a little bit about the process. Every year, you go through all the images you created over the last year looking for the very best. You can only choose four each year. Then you take each image and breathe life into it. You must do everything you can to ensure that the image is technically flawless and has maximum impact. You selectively lighten and darken areas of the image to draw the eye to the story it has to tell. You eliminate anything that could be a distraction, no matter how small—every blemish, every twig that is out of place. You look at the image upside down. Are there distractions you didn’t notice when it was right side up? Get rid of them. In the days of film (just 6 years ago), our tools were the print enlarger, a paper cutter, and a tray of photographic dyes that we would apply with a very tiny paintbrush. Now, we use the computer. Every image is matted, sprayed with a high gloss lacquer and titled. That title is crucial because it helps tell the print’s story to the judges. The moment the print appears before the judges, there should be a sudden intake of breath. The judges, trying to appear cool and well reasoned, are thinking, "Wow! I wish I had taken that!" Then and only then, do you have a merit print. 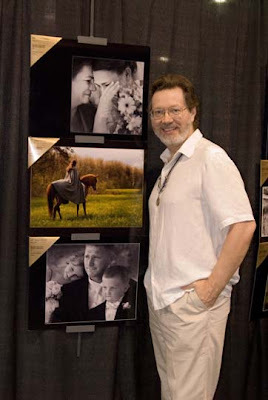 Every photographer who has ever entered competition knows the agony of putting their very best before the judges, only to be told, "That’s ok. . . but not good enough." Last year, three out of four of Neil’s prints were merit prints, giving him enough merits for his Master’ degree. 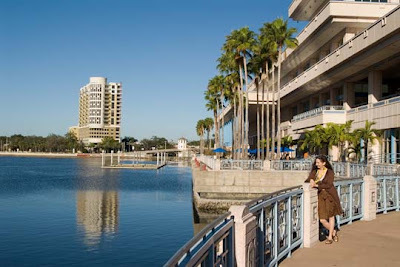 On January 5, we traveled to Tampa, Florida for the Professional Photographers of America national convention to receive his award. There were over 8,000 photographers from all over the world at this convention. We attended classes, looked at the print salon where the merit prints from 2007 hung, and spent hours in the enormous trade show, coming away with loads of fresh inspiration. On Tuesday evening, Neil donned his tux and we trotted off for official photographs and the awards ceremony. The ceremony was much like a graduation with speeches and special awards. There were over 200 people receiving degrees of various kinds. As the announcer said, "R. Neil Haugen, Monmouth, Oregon, CPP, FP, sponsored by Miriam M. Haugen, Master Photographer, CPP, FP" we walked onto the stage and I placed the gold ribbon around his neck and gave him a big kiss. He shook the hand of the PPA president who presented him with the degree certificate. Several of our colleagues from Oregon were there to congratulate Neil which made it all the more meaningful. The pursuit of this goal has made us better photographers. It has forced us to stretch and grow in ways we might never have chosen to on our own. What is the next goal? Neil and I will be working toward our Craftsman degree, which has an emphasis on teaching. In the process of teaching other photographers, we will become even better at what we do.